Did you know that our hair has positive and negative ions? However, activities such as brushing or towel-drying strip your hair of negative ions. When there are only positive ions in the hair, the strands repel each other, resulting in problems such as flyaway, frizz, and static. Our comprehensive ionic hair brush guide will provide you with everything you need to know about these brushes. We have included our top three options below. Read below for our full review on each of these options. What Does an Ionic Hairbrush Look Like? What’s the Difference Between an Ionic Hairbrush and a Regular Hairbrush? Which Brush Should I Choose For My Hair Type? 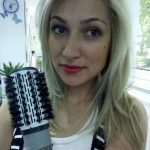 What Size Ionic Hairbrush Should I Choose For My Hair? Important Features to Look for in an Ionic Hairbrush? How do I look After an Ionic Hairbrush? Firstly, it’s a good idea to understand what ionic means and what this type of technology can do for your hair. Everyone’s hair is made up of positive and negative ions. Positive ions are those ions that are responsible for frizzy, flyaway and static hair whereas negative ions are what balance the hair so it’s shiny and manageable. The main problem is the atmosphere we live in encourages positive ions and certainly any moisture in the air will result in that frizzy look that we all try our best to avoid. As well as the atmosphere or climate that we live in, other actions encourage ionic changes. For example, brushing hair or towel-drying hair strips it of negative ions. Then, what’s left is hair with strands that work against each other and that’s where the problems start, flyaway hair, frizzy hair or static hair. Ionic hairbrushes can help. Powered by electricity, they produce negative ions directly to each strand of hair which restores the ionic balance. The heat from these ionic hairbrushes activates negative ions. Hair is left beautifully shiny, perfectly smooth, frizz-free and manageable. That’s what we all dream of! Most of these hairbrushes are affordable enough to use at home and I would say that if you choose a good quality ionic hairbrush you should be able to achieve fabulously sleek hair with lots of glossiness without even having to step foot in a hairdresser. “Is paying more for an ionic hair brush worth it?” is a question many women ask. What are the benefits that you get from an ionic hairbrush that you don’t get from an ordinary hairbrush? Apart from frizz free, static-free and flyaway free hair, expect smoother, softer and more manageable hair that has plenty of sheen. The ionic technology is also better for your hair and is kinder, so it helps to reduce the damage. The negative ions seal hair, closing off broken hair cuticles and smoothing out split ends. These ions also lock in moisture so hair is better hydrated and if you purchase a blow-drying ionic hair brush, they are generally quicker than using a regular hair dryer. They look just like regular hairbrushes except they have a power cord attached to the base which plugs into an electrical outlet. They also have buttons on the handle which control the temperature setting and power on or off. Some of them have an LCD display screen to display the temperature, which is useful if you need to keep an eye on it. The bristles are very different than a regular hairbrush. Firstly, some are rigid and others do have a little flexibility of movement and many are made out of materials like ceramic (a great heat conductor). The bristles heat up and it’s their material and heat that work with ionic technology to smooth out the hair’s cuticle while gliding through hair. It’s also worth mentioning that some ionic hairbrushes are battery powered or even come with a butane pack. If you have thick hair, look for a high wattage ionic hairbrush but finer hair or short hair is best suited to lower wattage. They are entirely different! They might look similar but that’s because they are both designed to glide through hair. A regular hairbrush is a manual tool whereas an ionic hairbrush is powered through electricity. The bristles are different as well. A regular hairbrush will have nylon, boar or plastic bristles that are flexible, but ionic hairbrushes generally have rigid bristles that are made out of ceramic (or similar material) and heat up. These bristles help to straighten and smooth out hair. Some ionic hairbrushes can be used on damp hair but most are for dry hair use, whereas a regular hairbrush can be used on wet (with care) or dry hair. Also see our comprehensive Hair Brush Guide here. It’s also worth mentioning that some ionic hairbrushes look like round brushes. These are great for curling hair or getting better body. Round brushes can still be ionic since they smooth out hair and get rid of frizz and flyaway. The flat brushes aren’t suitable for curling. 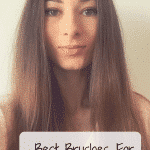 They are better for straightening out hair as they’re designed to glide through hair rather than curl it up. If you’re looking for a brush to create curl or body then select a round ionic brush as you can curl hair over the barrel. If you’re looking for straight hair styling, choose an ionic brush that looks like a regular hairbrush or even those that resemble a paddle brush. Paddle brushes are great for thick, course hair as they cope with greater amounts of hair at a time. If your hair is very fine, damaged or chemically processed, be wary of choosing an ionic brush with limited temperature settings because you want to be able to adjust the heat to suit your hair type. Remember to keep your brush on a low setting for your hair type or you run the risk of burning or damaging it. Thicker, courser hair can cope with higher temperatures and higher wattage. This mainly refers to round ionic brushes. If you have short hair or fine hair, look for a slimmer barrel because with a large barrel you may not be able to get your hair around it. For thicker, longer hair, choose an ionic brush that is larger as it can cope with more hair. A very slender barrel won’t work for thick, long hair and will take a very long time to get any curl into your hair! With regard to flat ionic hairbrushes (these look like regular hairbrushes), buy something similar in size to your own regular hairbrush. Choose a paddle style if you have lots of hair, they cope with more hair at once so it speeds up the straightening/smoothing process. Ionic hairbrushes are designed with the home stylist in mind, and so they are straightforward and easy to use. Ideally, they come with slender, non-slip grip for better user control. The bristles, which emit the ions, should be sturdy. Ionic brushes may be powered by electricity, battery, or butane pack. 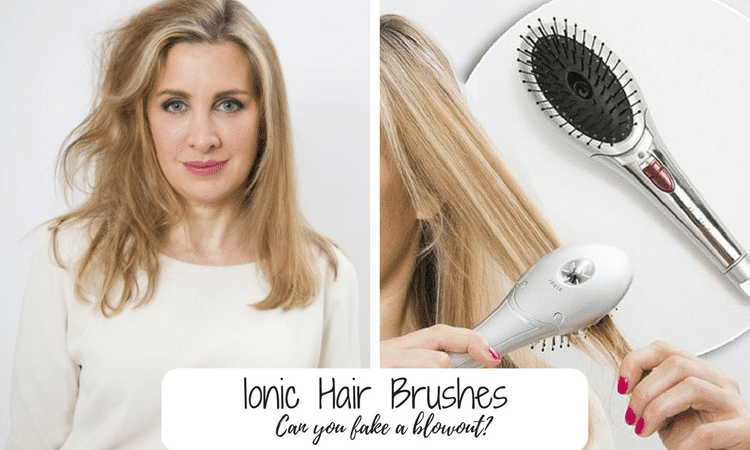 Ionic brushes have different wattage power. High wattage ionic hairbrushes are suitable for thick hair, while low-powered brushes are suited for thin hair. Variable heat settings for precision styling. Long cord for easy styling, especially at the back of your head. LCD display so you can see the temperature easily. Auto shut-off after a period of time, this is a safety precaution. Ceramic bristles as ceramic is a good heat conductor or flexible bristles if you want a blow-drying ionic hairbrush. Using an ionic brush is extremely easy. Firstly, make sure that the type of brush you use is suitable for what you want to achieve. For example, some ionic hairbrushes can actually dry hair when its damp, but others are only suitable for use on dry hair. Think about what you want to achieve. Sometimes, it’s useful to have a hair tool that dries damp hair! Never use an ionic brush on wet hair if it’s not designed for it. If you buy an ionic brush that’s shaped like a paddle or a regular hairbrush, simply plug it in and set it to your desired heat setting. Regardless of whether it’s suitable for wet or dry hair, always use a heat protecting spray as a barrier to the temperature. It’s always a good idea to section hair out and start with one section rather than just brushing hair. I would suggest starting at the back so you iron out any kinks. Unravel the first section of hair and brush it from root to tip. You should be able to smooth hair out in one pass, but you might need two or three. Try not to over-brush hair with your ionic brush or you might burn it. If you want some body, lift the hair using the brush from the root and brush outwards (rather than downwards). Repeat the action all over your head. Again, start by using a heat protecting spray and section your hair out. Start at the back and unravel the first section. Wind it around the brush and use the brush to curl up the hair toward your head and then back out again. This should create some curl and body. Repeat the process all over your head. Alternatively, use the round brush to glide through hair from the root and at the bottom, curl it under or flip it out. Round ionic brushes are great for a little extra body, whereas the flatter ionic brushes are better for a very straight look. Some ionic brushes blow hot air through the body of the brush which dries hair while styling. Use the same action as above but start with towel-dried, damp hair (rather than on completely dry hair). Remember, you can also use these types of ionic brushes on dry hair too as they’re useful for pepping up a hairstyle in-between washes. Always clean an ionic brush after use. That means unplugging it and allowing it to cool down and lifting out any stray hairs left in-between the bristles. With a soft cloth, wipe in-between the bristles to remove any styling product and dust. Do this once or twice a week, depending on how often you use it. Remember, like anything, if you look after it, it will last longer! Ionic hair brushes come in all kinds of prices, so defining the amount you’re willing to spend before you go shopping before you go shopping is important. Knowing also the features that will suit your hair and particular style in mind can help in determining the right styling tool to purchase. One of the most important things to consider is the shape of the ionic hairbrush; it can be circular or it can be flat. Your choice of shape brush would depend on the kind of effect or hairstyle you want to achieve. Ionic hair brushes also come in a wide array of sizes. The style that you want to create would dictate your choice of brush size. Do you want to create small or large curls? A ¾ inch brush create small curls or waves, 1 inch brush creates medium waves, while 1 ½ brush creates large waves. Another important thing to consider is wattage. If you have a thick hair, then you need a high wattage brush. If you have thin hair, a low wattage brush is the safer option. This is a round ionic hairbrush by Calista, a reputable hair tool brand. The Calista promises lots of body and shine. Do note that you can only use this hair tool on dry hair so don’t try it on wet or damp hair. It’s made out of ceramic which is excellent for controlling heat and creating smooth, shiny hair. The shape of the barrel means you can straighten, curl or add volume to hair. With a soft-grip handle, it’s comfortable to use and it’s suitable for all hair types, whether fine, thick, long or short. With heat of up to 395 degrees Fahrenheit and a digital LCD screen it’s easy to monitor the temperature and choose the one that’s right for you. It also has an auto shut-off button for safety. This is a great ionic hair brush that really deliver smooth, shiny, frizz-free hair. As a word of caution, don’t keep going over the same area, just one or two passes should be enough to achieve great looking, salon-style hair. You’ll find this is a good little styler that blow dries hair as it works its magic. Mid-sized, the barrel is ideal for mid-length and mid-thickness hair. It adds plenty of volume to hair while styling and is infused with ionic technology for frizz-free, static-free hair. It grips hair very well and cuts down on styling time so it’s a safe bet if you’re always in a hurry but want to style your hair beautifully! This ionic hairbrush is a generously sized hairbrush that is suitable for thick or very long hair. It’s also suitable for use on damp hair as it blows hot air and dries while styling. Excellent for creating large, bouncy curls and plenty of volume, the aluminum vented barrel heats up nicely while it blow dries which is excellent for styling while drying. This is a good all-rounder and really dries hair very quickly while ensuring a static-free, frizz free finish. This ionic product includes flexible bristles and blows heat through the middle of the chamber which is vented. It’s medium size, so its best for mid-length or long hair of reasonable thickness. Made out of ceramic and tourmaline, it’s a good heat conductor and draws frizziness away from hair leaving it beautifully smooth and sleek. The gel-grip handle makes it very comfortable to use but it doesn’t have multiple heat settings. However, you can use it on lightly damp hair. 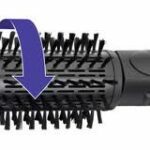 The Sam Villa Thermal Styling brush features a medium-size round barrel which is good for mid-length, mid-thickness hair and the flexible nylon/boar bristles grip well, without snagging hair. The central chamber is vented and emits hot air so you can dry hair as you style it. It suggests that it minimizes breakage and split ends but I’ve yet to find a product that does without taking enormous care to look after hair using other methods too!